The improved diffuser cap design of the Flexcap™ provides a non-plugging diffuser with an increased maximum air flow rate of 20 cfm. The larger circumference of the Flexcap™ diffuser (on left) in comparison to a typical competitive diffuser (right) provides additional design engineering benefits. Of additional importance are the location and number of the air release holes. On the Flexcap™ Aeration Diffuser, there are 16 air release holes on the bottom of the cap. 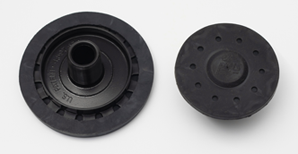 The competitor’s coarse bubble diffuser only has 10 air holes and they are located on the top of the diffuser cap. More air holes mean that less energy is required to produce the necessary oxygen transfer in your processing treatments. Because instrumentations are impacted by temperature, humidity and environmental conditions, your measuring and weighing equipment requires recalibrations at some point. The primary goal of preventive maintenance is to prevent the failure of equipment before it actually occurs and to ensure the accuracy and repeatability of your wastewater and water treatment operations. Why Change to a Flexcap™ Coarse Bubble Diffuser? As a proven coarse bubble diffuser leader for over two decades, the dynamic aeration (air flow rate of 20 cfm) and its longevity of more than 25 years would be sufficient reason to seriously consider replacing your current coarse bubble diffusers with Flexcap Diffusers. How often do you replace your systems’ coarse bubble diffusers? Every 3 years? 5 Years? No joking. We are proud to claim that no other diffuser can match the Flexcap™ Diffuser’s performance and longevity for on-going diffusion aeration in wastewater treatment and water treatment processing. The Flexcap™ Diffuser has a proven track record of reliability through engineering expertise and first-hand experience.